Nice when things progress smoothly.. 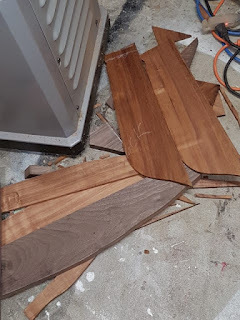 The Crossover guitar has had it coats of Royal-Lac post catalyzed finish applied, A new finish that I am trying for the first time and so far so good, it does get very good reviews by those who have tried it. it needs to cure for 5 days then I can buff/polish it. The Tenor Ukulele is done and plays actually quite nice despite all the build issues. 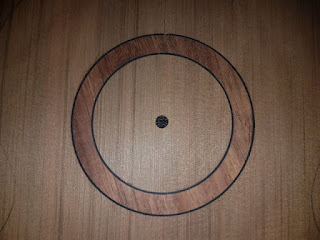 The Celtic Hap has had the pillar and neck cut to shape and I need to start on the soundboard glue up soon. 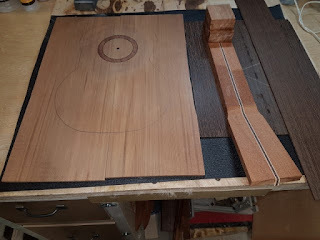 I've jointed 3 tops to take to the guitar voicing course I'm going to in June so I just need to fit the rosettes to those and they are ready to go. Of course that will take some time as I am trying a slightly different way of building rosettes as I mentioned earlier. I've also started another Tenor Ukulele this one using Wenge (left over from the crossover guitar) and Western Red Cedar. Lastly I've started a bit of an experimental instrument. I really like the Mandocello sound but personally don't play double courses of strings very well and also that low C on a Mandocello is tough to get enough tension on using a scale length I like so I'm trying what I call a Cello Guitar. A 4 string guitar tuned to Cello tuning CGDA and using nylon strings designed for Goldtone's Cello Banjo... I just need to decide on the bracing for the top. I'm using a Gibson L0 body shape so either a classical style fan bracing or maybe a version of Gibson old H bracing for that body style. We will see..